The Powder Puff bonsai gets its name from its delightful showy flowers. Those bright, puffy cotton ball-like blooms make the Powder Puff one of the most whimsical of all of the bonsai plant genera. If you’re looking to add a pop of color and joy to your bonsai collection, it’s hard to grow wrong with any of the Powder Puff species in the Calliandra genus. Description The puffy, vividly-colored balls of showy flowers are what give the tree its name. The Calliandra genus encompasses a host of tree species, most of which are slow-growing. Calliandra schultzei is a fast grower, however. Position The tree should be grown in a location that receives at least six hours of sun each day. More sun will be even more beneficial, resulting in a fuller tree and more vigorous tree. Powder puff trees are intolerant of temperatures below 65o Fahrenheit. In the USDA growing zones between 9b and 11, they can be grown outside year-round. Supplemental lighting may be necessary when the tree is grown indoors. Watering The tree likes consistently moist soil. Allow the top half-inch of soil to become dry, and then apply water gently until an excess of water begins to drain from the drainage hole of the pot. Feeding The powder puff bonsai tree requires regular feeding. Use a liquid fertilizer, and feed once a week during the period of active growth. Feed once a month throughout late-fall and winter. It is important to water the plant immediately after each application of fertilizer so as to speed the delivery of nutrients to the roots of the plant. Leaf and Branch Pruning Pruning can be undertaken throughout the year. The tree trunk should be shaped when the plan is young because that is when it is at its most supple. The trunk becomes increasingly rigid with age. Heavy pruning encourages denser growth and more numerous flowers. 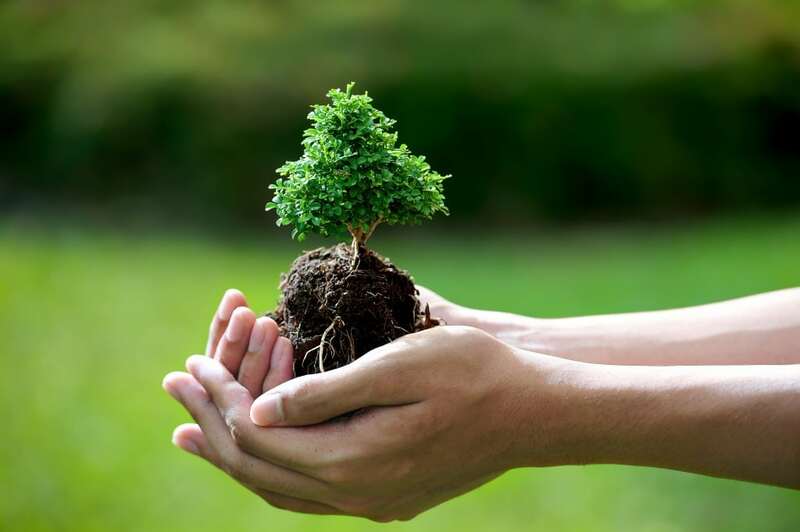 Re-potting & Growing Medium Trees of the fast-growing species will need re-potting each year, while the slower-growing species will need to be repotted every two years. The re-potting of the powder puff tree is ideally carried out during the warmth of late-spring/early-summer. A slightly alkaline, sand-based bonsai soil is ideal for the powder puff tree. Wiring The tree is highly responsive to wiring. Spring and summer are the best times to wire the plant because that is when lignification begins. Great care should be taken, however. Wires can damage the think tree bark, or snap older branches. Notes By regularly deadheading blooms as they fade, the tree will continue to produce blooms throughout the year – although the showiest, most abundant blooming will occur in spring and summer. The name Powder Puff refers to the genus Calliandra. Calliandra is a sizable genus with over 150 individual species. Most species are easy to cultivate but not all make great bonsai trees. Here are some of the Powder Puff species that are the easiest to grow as bonsai trees. On the whole, Calliandra is a slow-growing genus. But this Powder Puff is an exception. Impatient bonsai growers love this species because it grows at an incredible rate. With care, schultzei grows so quickly that it often needs repotting once a year and lots of water to accommodate its rapid growth. Haematocephala is one of the slower growing species of the Powder Puff genus. But it makes up in flower quantity what it lacks in speed. And because it is such a slow grower it tolerates lower light levels than other species in the genus. This makes it a great indoor plant. This species of Powder Puff is great because its divided leaves fold closed whenever you touch them. It’s also a great little bonsai. However, it needs high levels of sunlight and is best suited for outdoor growth in warm climates. It makes up for its fussiness with big, beautiful bright-red powder puffs that hand around all year long. Powder Puff bonsai trees need lots of sunlight, the more the better. When grown indoors, Powder Puff bonsai trees benefit from supplemental grow lights. In general, the more sunlight a Powder Puff receives the more densely its foliage will grow. If your Powder Puff looks sparse, increase its access to sunlight. All species of Powder Puff need at least full sunlight: six to eight hours of direct sunlight per day. As long as the sunlight is right, you can grow your Powder Puff bonsai indoors or out. In most areas, the weather is too cold for the Powder Puff to spend its entire time outdoors. The Powder Puff cannot tolerate temperatures lower than 65 degrees Fahrenheit. But it enjoys spending spring and summer outdoors. And if you live in USDA Growing Zones 9b to 11 your Powder Puff can live outside year round. The Powder Puff is hardier than it looks so don’t be afraid to leave it to its own devices as long as the weather is warm. It is resistant to most insects and diseases. However, the Powder Puff’s flowers are highly attractive to bees. If you are allergic or opposed to bee visitors, keep your Powder Puff indoors. The Powder Puff bonsai likes moist soil. Until you become accustomed to its watering needs (link to watering page), check the soil everyday by sticking a finger into the soil. The soil should feel moist, not wet. When the top half-inch of soil dries out, water the soil with a gentle stream from a watering can. Stop watering when water begins to drip out of the drainage holes in the bottom of the bonsai tree’s container. The Powder Puff is a heavy feeder. During the growing season when the Powder Puff is actively growing, fertilize it once a week with a balanced liquid fertilizer. When the Powder Puff stops actively growing in late fall through winter, cut back fertilization to once every month. Water the Powder Puff after each fertilizer application (link to fertilizer page) to help carry the fertilizer down to the deepest roots. The Powder Puff bonsai responds well to shaping (link to starting techniques page). The trunk must be shaped while the Powder Puff is still young and supple. Older Powder Puff bonsai tree trunks are rigid and difficult to bend by novice bonsai growers. Luckily, they still look beautiful as upright trees. The Powder Puff bonsai’s branches respond well to wiring in spring or summer when they are just beginning to lignify. Then the branches are pliable and take even severe bends with ease. Older branches are brittle and prone to snapping under wire. Monitor wired branches closely. The Powder Puff’s bark is thin and can be easily damaged. One of the reasons that the Powder Puff makes such a great bonsai tree is that it responds extremely well to frequent pruning (link to pruning page). Since the Powder Puff blooms and shoots on old wood, hard prunes just make it produce more, showier foliage and flowers. Prune your Powder Puff’s foliage frequently during any time of the year. The more you prune, the more dense your Powder Puff’s flowers and foliage will grow. But keep in mind that a Powder Puff looks its best when its canopy is full and bursting with flowers. Since Powder Puff trunks rarely thicken most of the tree’s beauty lies in its foliage. To encourage your Powder Puff to bloom year-round, deadhead its blossoms as soon as they begin to fade. Your Powder Puff will keep producing flowers as long as you keep pinching them off. But it will save its best show of blooms for spring and summer. The frequency with which you need to repot your Powder Puff largely depends on the species. Fast growers may need potting as frequently as once a year. Slower growers may thrive in the same pot for two years. When in doubt, let your Powder Puff’s roots be your guide. When they become unruly and grow out of the drainage holes or over the edge of the pot, it is time to repot. Avoid putting off repotting. Powder Puffs are sensitive to root pruning. Hard prunes may cause them to drop their leaves. 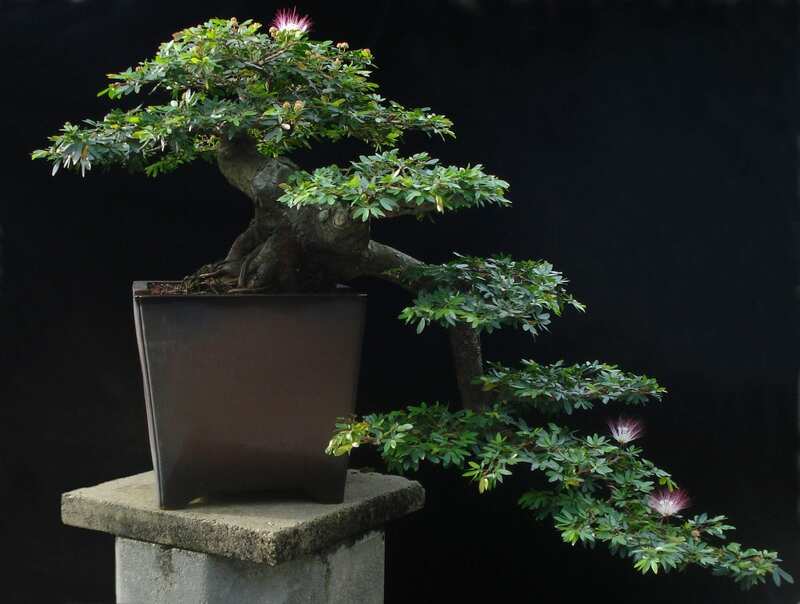 The best time to pot a Powder Puff bonsai is during the warm months of spring and summer. However, if you live in a tropical or subtropical climate you may repot your Powder Puff during any time of the year. Bare your Powder Puff’s roots when you repot and discard all of the old soil. Replace it with fresh, sandy bonsai soil (link to soils page) that is slightly alkaline.